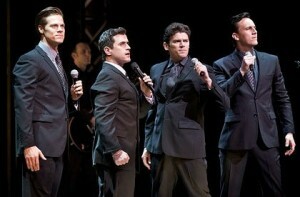 Look at the pictures of Australian actors who play The Four Seasons–Bobby Fox (Frankie Valli), Scott Johnson (Tommy DeVito), Stephen Mahy (Bob Gaudio), and Glaston Toft (Nick Massi). 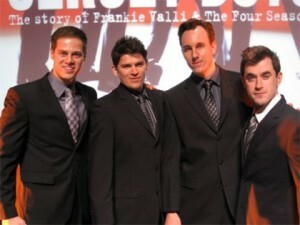 Beyond being a feast of the Four Seasons’ hits and a compressed journey through their lives, Jersey Boys celebrates the Italianism of Valli (Bobby Fox), Tommy DeVito (Scott Johnson), Bob Gaudio (Stephen Mahy) and Nick Massi (Glaston Toft): the tribal loyalty, the mob connections and the genetic, God-given ability to sing. The cast’s sterling efforts are amplified by the expert creative team that realised the original Broadway production, including the director Des McAnuff, choreographer Sergio Trujillo and set designer Klara Zieglerova. A band under Luke Hunter provides sure accompaniment. 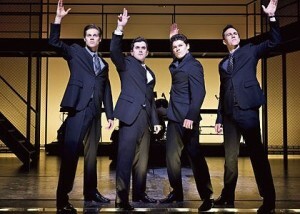 Buy Jersey Boys Theatre Royal Sydney Tickets to see the Australian actors LIVE in Sydney. Loved the show, I hvae seen it many, many times. You boys are fantastic ! !